WB No. 246: CHIMAERA—a cruising ketch that takes inspiration from a variety of existing designs. She’s a simple, rugged, and good-looking boat that’s equally at home at sea and in shallow coastal waters. CHIMAERA’s twin bilge keels will be very effective. 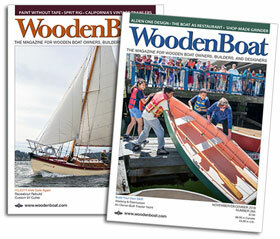 As the boat heels, the leeward board is pressed deeper into the water, increasing lateral resistance; the windward board meanwhile creates downward lift, increasing the boat’s stability. Fixed keels, rather than retractable bilge boards, were chosen because they have no effect on the accommodations. 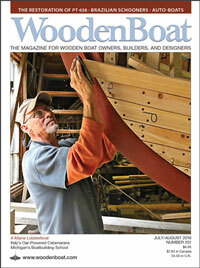 See more in Designs: Sketchbook, WoodenBoat issue 246.